Head of US Immigration Agency Scolds California Mayor Over Raid Warning - Integration Through Media ....! 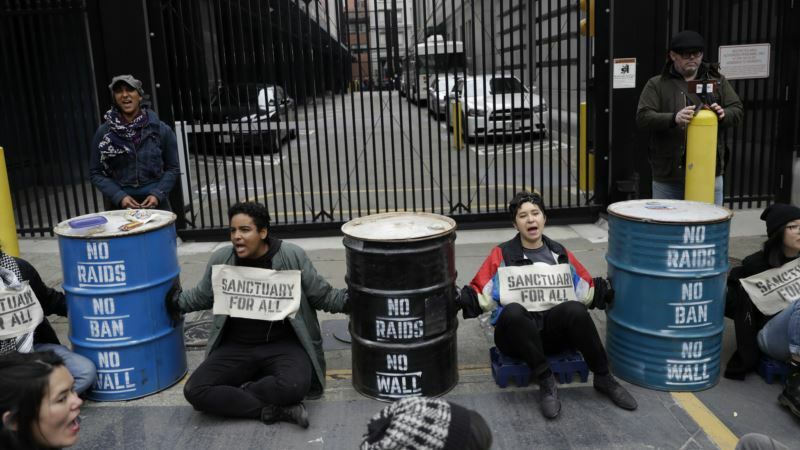 (VOA): The head of the U.S. immigration agency is railing against a California mayor for giving a heads-up to the undocumented immigrant community right before raids in the northern part of the state. Oakland Mayor Libby Schaaf on Saturday announced that she had learned through “unofficial channels” that the federal Immigration and Customs Enforcement agency, or ICE, was planning arrests in the area. Since Sunday, ICE agents have arrested more than 150 undocumented immigrants in raids across northern California. On Wednesday, ICE Acting Director Thomas Homan told Fox News that Schaaf’s action was “no better than a gang lookout yelling ‘Police!’ when a police cruiser comes in the neighborhood, except she did it to an entire community.” He said because of her warning, agents were unable to arrest more than 800 people with “criminal records.” “I have to believe that some of them were able to elude us, thanks to the mayor’s irresponsible decision,” Homan said. ICE officials said they were targeting some 1,000 people. They said about half of those arrested had criminal records, but they did not elaborate on the nature of those records. Schaaf said on Tuesday that she did not regret issuing the warning. “My statement on Saturday was meant to give all residents time to learn their rights and know their legal options,” she said. “It was my intention that one mother, or one father, would use the information to help keep their family together.” ​Schaaf said she had consulted her legal team before issuing the weekend’s warning, and they had determined she did not violate any laws because she had obtained the information from unofficial sources, rather than through formal government channels. But former federal prosecutor Tony Brass told CBS News in San Francisco that “she’s on the threshold of obstruction of justice for doing what she did.” Last week, U.S. President Donald Trump threatened to withdraw immigration enforcement agencies from California, accusing the state of shielding “horrible criminals.” Trump predicted state officials would be “begging” for federal immigration authorities to come back within two months because crime rates would skyrocket.